The Coen Brothers anthology The Ballad of Buster Scruggs portrays the frontier as a place of death so sudden and terrible that the word "ironic" is too fancy for it, with demises as swift as a dropped anvil in a Road Runner cartoon. As filmmakers, the Coens often create equal and opposite reaction to film classics, spinning off of ideas they're trying to top, honor or besmirch. (This tribute to Westerns starts with a common prestige-movie beginning of the old days: a hand opening a leather-bound volume and turning the pages.) But the half-dozen tales are closer to Ambrose Bierce than Louis L'Amour. One of the briefest, "Near Algodones" with James Franco as an unlucky bandit, seems to be a riff on "An Occurrence at Owl Creek Bridge." The longest, "The Gal Who Got Rattled," has moments as sincere as the Coens' best film, True Grit. This tale opens at a boarding house, where Alice (Zoe Kazan) spends her last night in civilization before joining a wagon train on the Oregon Trail. Her companions are her useless brother and a yappy, troublemaking terrier named President Pierce. Kazan is sweetly appealing in a sunbonnet during a slow, cautious romance with trail boss Billy Knapp (Bill Heck, courtly and gallant—the kind of cowboy you buy movie tickets to see). He dallies with the idea that he could settle down with her in the Willamette Valley, but then a war party of Indians show up. The brutally staged skirmish is worthy of the Randolph Scott era in Westerns. 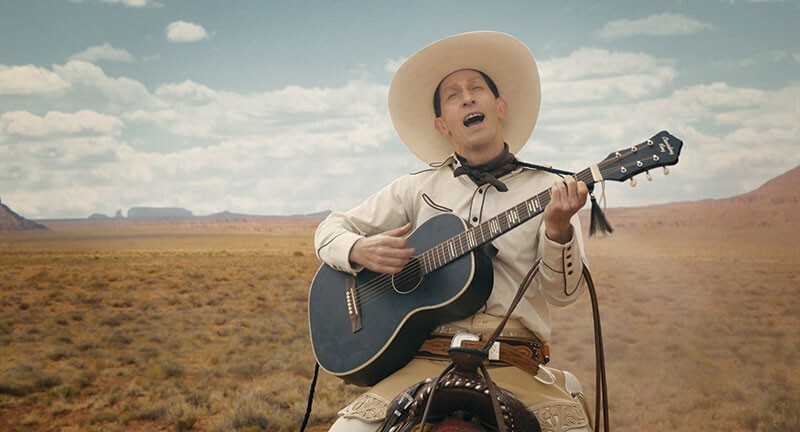 In the title episode, the chummy, white-clad Buster Scruggs (Tim Blake Nelson) rides in, playing his guitar on horseback and warbling "Cool Water." This sunshiney rambler shows us his wanted poster, which gives his alias as "the Misanthrope." We find out how he earned the name after greasy tavern polecats urge him at gunpoint to play a dead man's hand, aces and eights in spades. "Things have a way of escalatin'," he drawls. If the Coens' Hail, Caesar! seemed like inside baseball, this savage assault on the milk-drinking cowboys of yesterday delves even deeper into semi-forgotten movies. One of the best of these tales is the finale, a straight-out tale of terror called "The Mortal Remains" that follows a party of five bouncing down a dark road in a stagecoach: a smelly, talkative trapper (Chelcie Ross), a philosophizing Frenchman (Saul Rubinek) and a haughty dame (Tyne Daly). Riding up top is a corpse sewn up in canvas, the property of other two passengers: one, a formidable Irishman (Brendan Gleeson); the other, a twinkling-eyed dandy named Thigpen played by an astonishing Jonjo O'Neill, who sets a claustrophobic mood that goes from hideo-comic to absolutely deadly. Asked if he'd known the deceased well, Thigpen smiles: "Yes—at the end of his life." Frontier humor: it always means the kind of joke on someone who'll either die or who'll wish he was dead. 'The Ballad of Buster Scruggs' streams on Netflix starting Nov. 16.